Just over six years ago, before moving to Berlin, I worked in retail management and leadership. We had weekly early morning leadership meetings to discuss the business and plan and strategize for the weeks ahead. Even back then I relished in opportunities where I could cook for others, including my colleagues. I can’t begin to tell you how many countless variations of this breakfast bake I’ve made for those team meetings. Sometimes, I’d add nuts or oatmeal. Other times I’d make it with other types of berries or apples. Everyone’s favorite seemed to be the version made with blueberries, especially warm with a drizzling of syrup for added sweetness. It’s also enjoyable at room temperature. 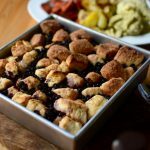 And while a fork is ideal for raking up all of the juicy blueberries, this can be served just like monkey-bread (pull-apart bread), allowing eager, though sticky, fingers to yank chunks from it. I love dishes like this. For me, it evokes a wonderful sense of comfort and familiarity. Undoubtedly, it’s the smell of baked, caramelized sugar, cinnamon, and blueberries. The aroma is equally intoxicating and nostalgic; reminiscent of early Saturday mornings at my grandma’s house just as I sank deeply into her sofa, still in my PJ’s, preparing to overindulge on a marathon of morning cartoons and whatever baked delight grandma had planned for breakfast. Whenever I baked this for colleagues for those morning meetings, I employed the help of store-bought biscuit dough, which was a real time saver. 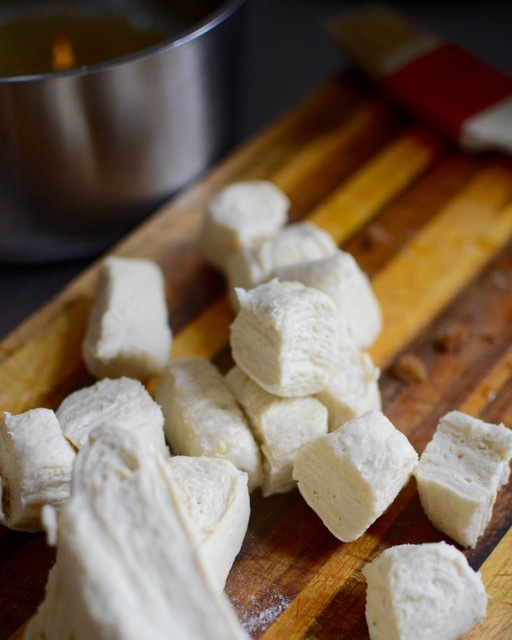 Store-bought dough comes in cardboard tubes in the dairy case, often near the cheeses and butter. Surprisingly, it hasn’t been until the last few years that I’ve been able to purchase these tubed doughs here in Berlin. Of course, it is entirely possible that during spells of being scatterbrained and unattentive while shopping that I’d just not noticed them in the markets until recently. And thankfully, I am a lot more confident in my dough-making abilities these days, so the need for store-bought dough hasn’t really presented itself. That being said, there is for me a nostalgic quality about packaged, tubed-dough. As a child, my mother used these doughs, which were available in a variety of biscuits, dinner rolls, and even croissants. I remember the uneasy feeling of peeling back the cardboard wrapper just until the tube popped from the pressure of the dough compressed within it. It is the childhood equivalent of the uneasy feeling I get from watching other people open champagne bottles anywhere near me. I’m absurdly anxious about it. As childish as it sounds, I often cower to avoid being in the direct sightline of the cork in the unlikely event that it should fly wildly in the air and hit me in the eye with missile-like precision. I digress. The point is, even if you could make your own dough, there is nothing wrong with employing pre-packaged provisions every now and then for a bit of semi-homemade deliciousness. However, since I am almost certain that my grandmother would have never used packaged dough, I am also including a recipe for homemade biscuits. Having done the footwork in testing both, homemade and store-bought dough, I can confirm with great confidence what you may have already concluded — homemade is better! But, don’t let that stop you from using the pre-packaged stuff since cinnamony, sugary, berry-stained bread in any way that you make it is almost always good. Homemade biscuit dough rolled out to a rectangle and cut into 1-inch squares. Store-bought biscuit rounds cut into quarters. 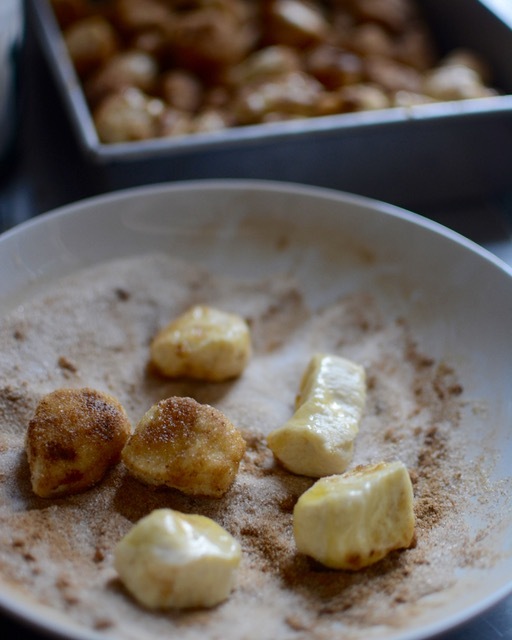 Pieces of dough covered in cooled butter and rolled in cinnamon sugar. In thinking back on it, I can’t imagine what possessed me to wake-up in the wee hours of the morning to bake before heading to those early morning meetings. I suppose it was partly because of my love of food and desire to feed anyone willing to eat. But the truth is, it was largely because I cared so much about the people I worked with. Just in the same way we express our love and appreciation to those we invite into our homes with the promise of a comforting meal, I’ve always taken that same approach wherever I’ve worked. No matter what the setting, whether it’s in the comfort of your home or at the office, food made from the heart has a way of expressing our love and appreciation for the people in our lives, often in ways that words cannot. 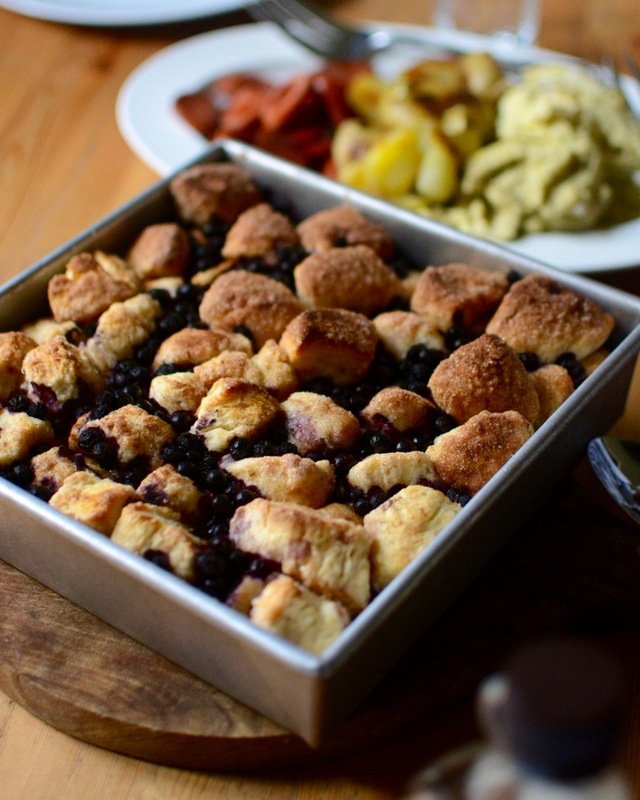 Cinnamon-sugar covered dough scattered with frozen blueberries. Begin by melting the butter in a small saucepan. Once the butter is melted, allow it to cool slightly while you carry on. Line the bottom of a 9 x 9 x 2” baking pan or baking dish with parchment or lightly grease it by brushing it with some of the melted butter. If at this point you are not using store-bought dough, proceed with the biscuit dough recipe below in the second recipe. If you’re using store-bought dough, separate the dough rounds and cut them into quarters. Mix the sugar and cinnamon in a small mixing bowl until well combined and uniform in color. Then, take the pieces of dough and dip them into the cooled butter and then immediately into the cinnamon-sugar. 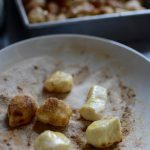 I often dip the dough in the butter and cinnamon-sugar with my hands— so if your butter is too warm to work with, allow it to cool until the heat is manageable. Once the pieces have been covered with the cinnamon-sugar arrange them into the prepared pan. I don’t worry too much about arranging the pieces neatly in a single layer and in fact, you’ll have too many pieces of dough to do so. The dough will expand as it bakes so it is a good idea not to overcrowd the bottom of the pan. You should have enough dough that a second layer will be necessary. Once all the dough is in the pan, scatter on the blueberries. Allow a few of the berries to bury themselves in the nooks and crannies of the dough. Bake the pan in the center of the oven for about 45-50 minutes. Be sure, however, to check at the 30-minute mark as the sugar will begin to brown and caramelize. Once it has browned, cover the pan with tin foil to prevent it from burning. Remove from oven and allow to cool slightly. Serve warm or at room temperature with maple syrup or blueberry syrup. You can assemble the entire dish the night before and bake it off in the morning. In a large bowl, sift together the flours, sea salt, and baking powder. Then, add the buttermilk, and stir the mixture until just combined, being careful not to over mix! 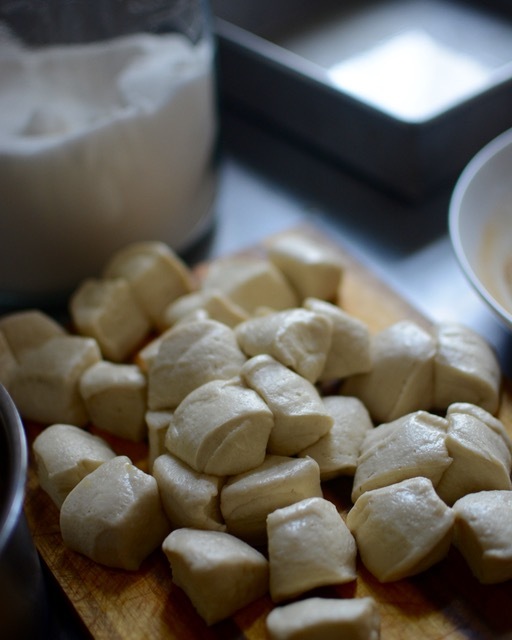 Dump the dough onto a floured surface and divide the dough into rounds. Roll out the first round of dough into a 6” x 9” rectangular mass, that is approximately 3/4” thick. It doesn’t need to be exact. It’s more important to work quickly so that the dough stays cool. Then, fold the rectangles into thirds — just as you would a letter. Afterwards, roll the dough out into another rectangle. Then, repeat by folding the dough into thirds then, once more, roll it out into a 6″ x 9″ rectangle. Repeat this for the other half of dough. 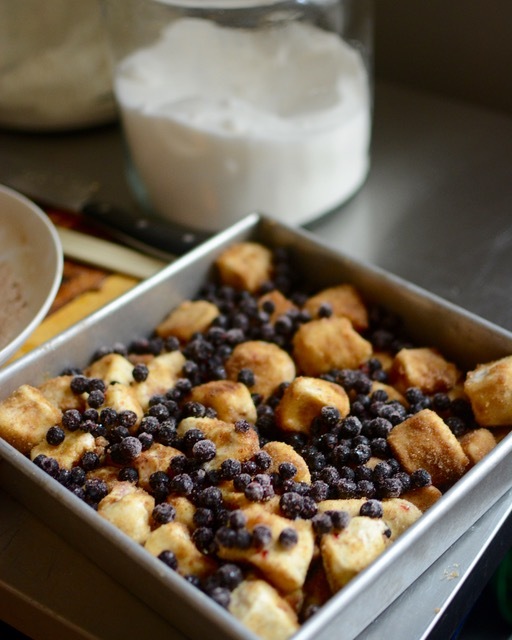 Then, cut the rectangular slabs of dough into 1½-inch cubes for the blueberry bake. Alternatively, you can make biscuits with this dough by cutting out 4-inch rounds, brushing them with an egg wash or cream and baking them 2-inches apart on a baking sheet for 20-25 minutes or until golden brown. This dough makes about 16 biscuits.